A salty, crumbly, curdy cheese that is most often made from goat's or sheep's milk. As opposed to other cheeses which are aged or cured, Feta Cheese is pickled in brine, hence its high salt content. Feta Cheese is a key ingredient in the making of Greek salad. Feta cheese is produced in block form, but is sold in many varieties including blocks, cubes, and crumbles. The texture of this cheese varies from soft to semi-hard. Choosing: Greek feta cheese soars past French and some Italian cheeses in the imported cheese markets. Creamy, tangy and moist, Greek feta cheese fares well as part of a cheese course, eaten on its own with fresh country bread or as an essential ingredient in Mediterranean-style recipes. With so many brands of feta available today, let the tips below guide you in choosing a premium product. 1. Look for Greek feta cheese wrapped in Cryo-vac containers. These should contain some of the brine the cheese was made with. Tightly-wrapped feta cheese resting on a plastic or foam platter does not contain brine, which adds flavor and moisture. 2.Read the label for country of origin. Select Greek feta cheese imported from Greece, rather than from France or Bulgaria. Greek feta makers produce the cheese with ingredients from different regions and offer a greater variety of textures and tastes. 3.Check the ingredients list on the label. Make sure it contains at least some goat's milk or sheep's milk, as opposed to purely cow's milk. Goat's milk or sheep's milk give Greek feta cheese its distinctive taste. 4.Buy several different brands of Greek feta cheese and taste each one. It should be creamy, moist and slightly sharp. 5.Examine the packaging of the Greek feta cheese. The cheese should look moist and very white in color, rather than a dried-out brick or loose mass of yellowish crumbs. Buying: As of July 2002 within the EU, feta cheese is designated as PDO, meaning it has a "protected designation of origin." However, no such rule exists within the United States. As such, you should pay specific attention to the type of milk (mostly sheep, some goat) used. Any similar cheese containing cow or buffalo milk is technically not considered feta cheese. Feta is delicious crumbled over traditional Mediterranean Salads. Did you know that you can make it yourself by using some common household ingredients? It is an easy, fascinating process with a great result. Warm one gallon of fresh goat's milk to 30°C (86°F), stirring it regularly so that it does not burn on the bottom. Remove it from the heat and set aside. While the inoculated milk sits, dissolve 1/2 tablet of rennet in fresh, cool water. Let the cheese drain in the handkerchief until no more whey drains out (about 2-4 hours). It may be drained at room temperature or in the refrigerator. * If the culture becomes contaminated at any point, the likelihood of contracting food poisoning from the cheese is greatly increased. * Do not use city tap water to dissolve rennet as it most likely contains chlorine that will make the rennet fail. * A cheese mold: Cut the ends out of a smooth-sided 4 x 5 inch tin can, save one of the cut ends. Feta is a common ingredient in many Greek dishes, and is eaten both raw, cooked, and grilled. It is a necessary ingredient in the common Greek salad (traditionally composed of tomatoes, cucumber, romaine lettuce, green peppers, red onion, kalamata olives, feta cheese, and a dressing of olive oil, salt, pepper, and oregano). Cleaning: Feta cheese generally comes in an entirely edible form. Feta cheese is served best fresh, but if properly stored in milk or salt-water (as a brine solution) it can last up to three months, refrigerated. This cheese can also be frozen, but will be prone to crumbling upon defrosting. Feta can also be "marinated" in olive oil. For this method, it must be completely covered in the oil, and in an air-tight container. This should not be refrigerated. Feta cheese is incredibly important not only in Greek cuisine, but also throughout the culture. In fact, it is so important that Greece argued with fellow EU countries France and Denmark, who were producing a cheese labeled "feta" made in a similar, but yet distinct, fashion from the classic Greek feta cheese. 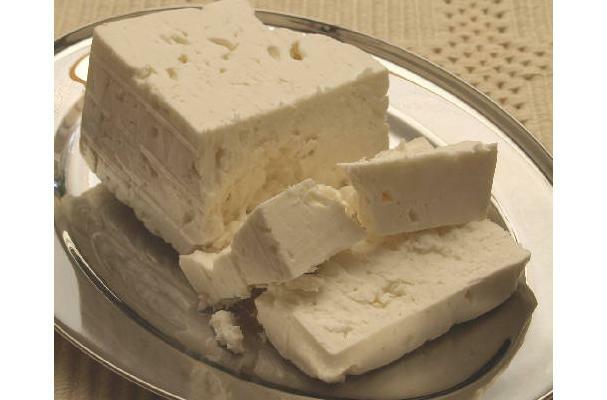 History: Feta cheese has been eaten (albeit under different names) since as late as the 1400s. Originally referred to as "fresh," or "recent" for it's taste, the Greek word "feta" is appeared in the Greek language during the 1600s, and is derived from the Italian word "fetta," meaning "slice." It has historically been produced by peasants.